We are one of the leading and eminent organizations involved in manufacturing, supplying, and exporting Infant Mucus Extractor. 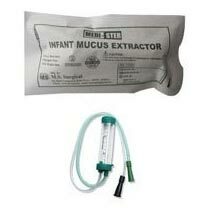 Infant Mucus Extractor is designed for the purpose of respiration problems in infants. Infant Mucus Extractor is transparent and suits various purposes like aspiration of secretion from oropharynx in newly born babies to ensure free respiration, low friction surface catheter is provided with open end silk smooth round tip for trauma free insertion of the aspiration. Infant Mucus Extractor is provided with spare plug cap that is used to seal the container for safe transportation of specimen to the laboratory or aseptic disposal of container.